"Deux Chevaux" is an exciting moving 'sculpture', which thousands of London public will see travelling through Kensington, Chelsea and Westminster on the 21st June, stopping at nine local cultural landmarks from Serpentine Gallery to V&A to Duke of York Square. 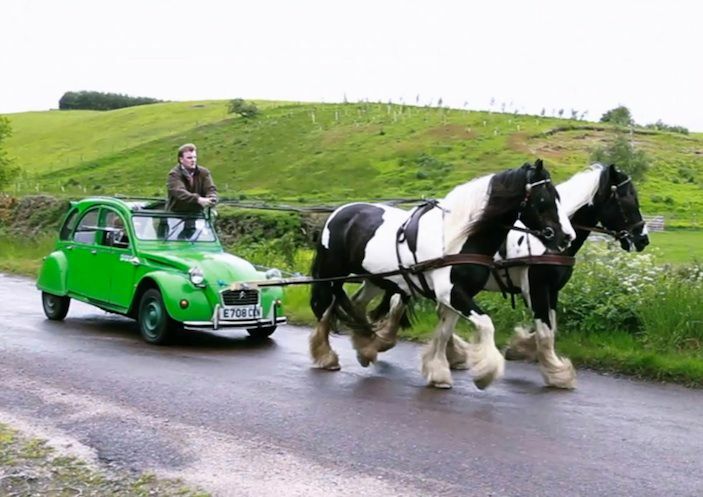 The day-long art performance involving two horses pulling an old Citroen 2CV (a two-horse power car) is the latest performance-based project by British artist William Mackrell. Humorous, spectacular, thought-provoking, this arts event will engage Londoners of all social and age groups from toddlers to art critics to old pensioners. The work challenges the interaction of human and mechanical power, questioning language's ability to measure their differences and similarities and asks what happens to this action when confronted with the unexpected in the everyday life. This is an independent art performance is kindly supported using public funding by Arts Council England, a development grant from the Royal Borough of Kensington & Chelsea Council, Andipa Gallery, Chelsea Theatre, Crowdfunding and co-ordinated through the Exhibition Road Cultural Group with local Museums, cultural centres and the Royal Parks.